In this post I would like to cover two main topics: auditing the administrative access to the Control Station, and auditing events. Auditing is a specialized form of logging. The purpose of auditing is to record the “security-relevant events” that happen on a system and provide sufficient information about who initiated the event and the event’s affect on the system (eg. success or failure). Auditing is one of the highest priority customer requests in the system management arena. The auditing feature on VNX Control Station is enabled by default and starts when the CS is booted. FS_WATCH – associated with accessing a file system object that has an explicit watch placed on it. /sbin/auditctl – this command controls the kernel’s audit subsystem. The audit.log file is a plain text, but it contains numeric values that make it difficult to read. The ausearch command offers options that translate the values to names. /sbin/aureport – this command produces summary reports of the audit logs. /sbin/service auditd – this command controls the audit subsystem and has the listed options. The auditing configuration files and the current audit log file are back up to the backend file system /nas/var/auditing. 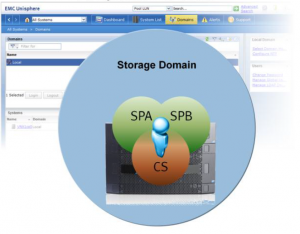 Every 180 seconds the auditing backup is performed for each Control Station. If the Control Station in slot 0 is replaces, the software recovery steps try to automatically restore the audit configuration from the backend backups. Recovery of the slot 1 Control Stations auditing has to be performed manually. 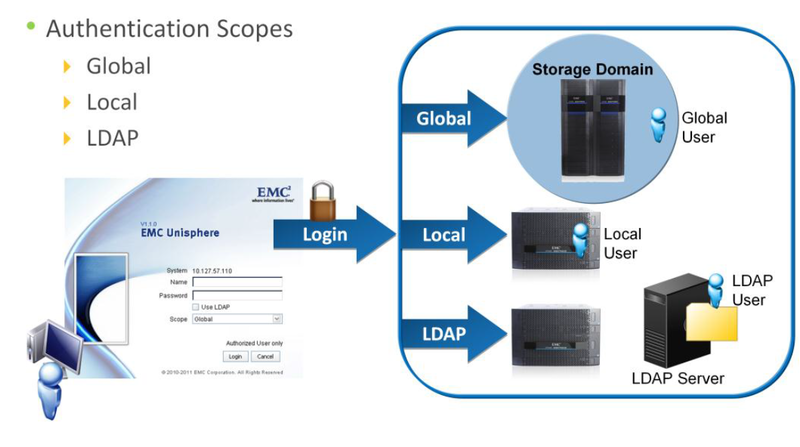 Let’s talk a little about VNX for File and monitoring features provided by Unisphere. I will explain where to find event logs, how to create an e-mail notifications, how to set up notifications for various Severity levels. Let’s first have a quick glympse of Unisphere monitoring features. 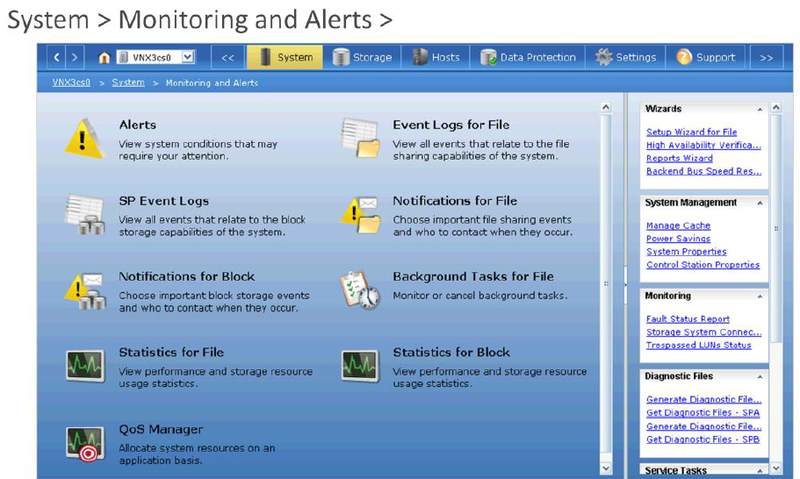 There are several areas within the Unisphere System monitoring page, where the system can be monitored. SP Event Logs – SP logs can be collected and exported via the graphical interface. 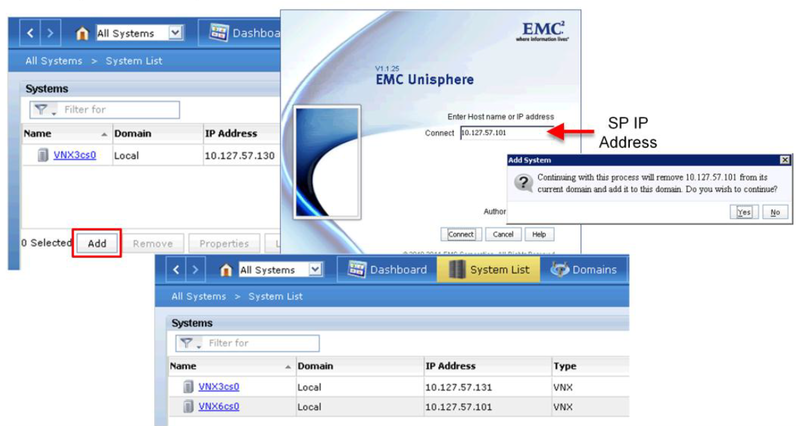 Event Logs for File – place where File related events can be monitored. The page can be configred to display log messages from the Control Station or the Data Movers. Notifications for File – a notification is an action that CS (Control Station) takes in response to a particular system condition. 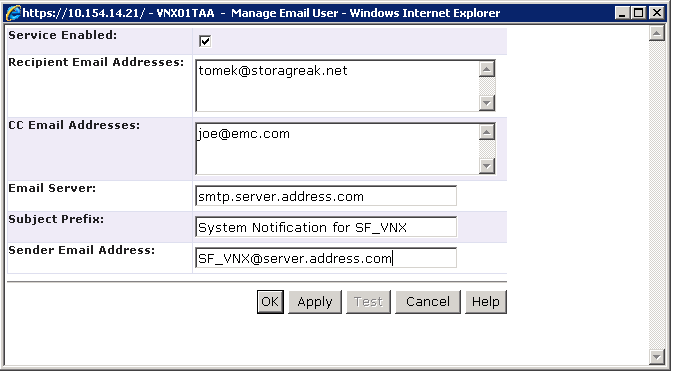 For example, the Control Station can send an email message to an admin when a critical system event occurs, such as a disk failure. Another example would be a threshold being reached, etc. 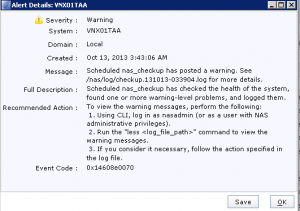 Event Severity levels are: critical, error, warning, info. Statistics for File – this option provide the user with information file system and network performance. Graphs are configurable and given in real-time. Once you have configured the e-mail information (provided in the form above) you can now create an event. 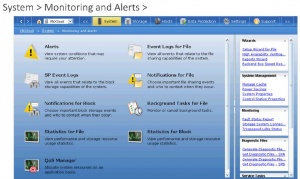 Navigate to System > Monitoring and Alerts > Notifications for File. Then select the Create button and a popup screen will prompt for which Facility you want to monitor. Take a look at picture below. Choose the event you want monitored. 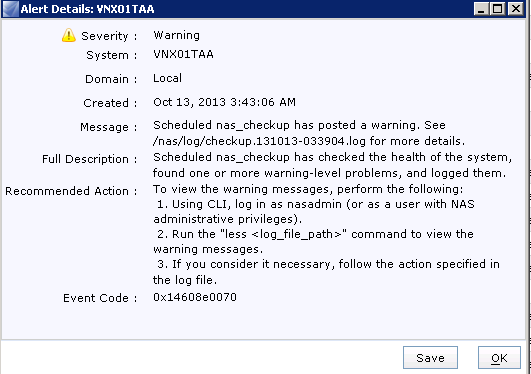 The nchoose the Severity level (Critical, Error, Warning or Info) for events to be notified for. 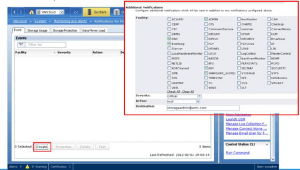 Select how the notification will be sent (the options are: mail, logfile, smtp trap). 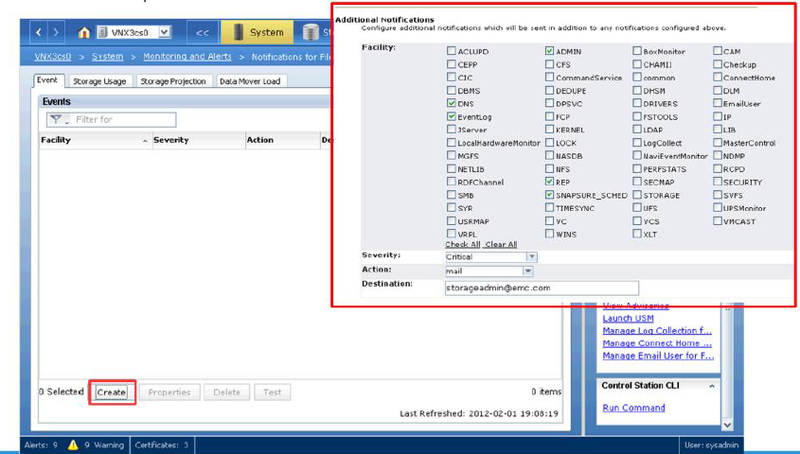 For logfile you have to provide an absolute path on the control station ot save it, for SMTP trap you can provide IP address, community name or a hostname. The example e-mail notification is presented above.